AliveCor from Andrew J. Schuman on Vimeo. Steve Jobs introduced the SmartPhone in 2007 and there are now many “connected” devices that have transformed smartphones into medical devices. We now have connected pulse oximeters, glucose monitors, otoscopes and dermscopes, to name a few. 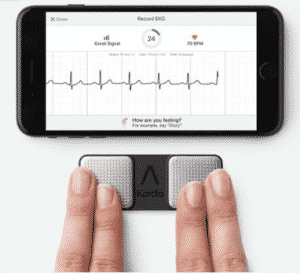 AliveCor has met with significant success with the introduction of their KardiMobile device/application and the KardiaBand that transforms the smartphone into a portable EKG screening tool. As discussed in the video, the KardiaMobile device consists of a small sensor strip upon which one places one or two fingers of both hands. The application then records an inverted lead EKG that is from 30 seconds to 5 minutes in length. This can be reviewed on the smartphone and even transmitted to one’s physician as a pdf file so it can be included in the medical record. The EKG can also be reviewed by a cardiologist at cost of $19. The device and application is appropriate for screening for dysrhythmias or monitoring already diagnosed dysrhythmias in a patient. The cost of the device and the application is $100 and is approved for patients 18 and above. It works with android and IOS smartphones and tablets. 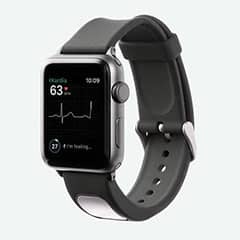 More recently AliveCor introduced their $200 KardiaBand for use with the Apple Watch. One activates the watch application and holds a thumb to a sensor on the band. A thirty second recording is then recorded and transmitted to the KardiaMobile application which can be reviewed and shared.